Chief director Nozomu Ogawa tells TAB about the project’s upcoming plans. This is the second installment in a series of articles produced collaboratively by the Tokyo Culture Creation Project and Tokyo Art Beat. In this piece, TABlog writer Rei Kagami takes a look at the local community-based art project “TERATOTERA”, centering on the area that stretches from Koenji to Kichijoji along the JR Chuo Line. Launched this spring, TERATOTERA is an art initiative whose name is derived from the two towns of Koenji and Kichijoji (the kanji 「寺」 in their names can be pronounced as both “ji” and “tera”). The project seeks to build connections across these two areas and find common ground (“terra”) between them. The term “Chuo Line culture” has been in vogue for some time now. Traces of a certain nostalgic atmosphere dating from the Showa era (1925-89) can still be found in this area of western Tokyo, which is home to various subcultures and emerging trends and movements. The towns in Suginami Ward along the Chuo Line are some of Tokyo’s most popular residential neighborhoods, drawing a steadily increasing number of loyal devotees. TERATOTERA seeks to build links between the various arts venues scattered throughout this area of Tokyo, and to develop and nurture its cultural potential in new and innovative ways. Concrete discussions that led to the establishment of TERATOTERA began at the end of last year, and an inaugural event, including an information session and reception, was held on February 21 this year. The official launch event was held on the evening of March 21 at Café Zenon, located beneath the elevated railway tracks near Kichijoji Station. Shortly after the café doors opened at 6pm, TERATOTERA chief director Nozomu Ogawa gave an opening address. This was followed by a roundtable talk by key figures from several cultural institutions located in the area stretching from Koenji to Kichijoji. Yuji Minoshima (director, Kichijoji Theater), Hiroyuki Takekawa (Baus Theater) and Yoshizo Yoshimura (designer, Devil Robots) discussed the possibilities of the TERATOTERA project from the perspectives of their creative outfits, while Masahiko Yamaguchi, editor of Sanpo no Tatsujin (a popular walking guide to Tokyo) and Tsukasa Mori (director, Tokyo Artpoint Project) chipped in with their own thoughts on the particular charm of this area of the city. 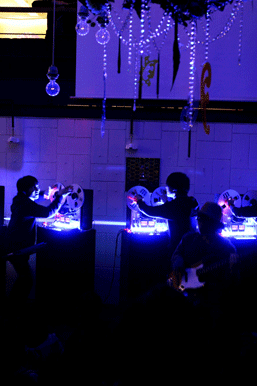 Next, members of the Open Reel Ensemble gave a sound performance, manipulating four vintage open-reel tape recorders and using them as both instruments and turntables to create a dynamic, live-action experience for the audience. After the performance, Ichiro Endo, who was participating in the “Beppu Project 2010: Art, Dance, Architecture and the City” festival in Kyushu at the time, chimed in to voice his support for the project. A second roundtable discussion by artists Yusuke Asai, Taro Izumi and Ryuta Ushiro and art critic Daisuke Awata followed, as well as a performance by Contact Gonzo, a street fighting collective whose members advocate “the philosophy of pain and the art of contact”. Contact Gonzo stage improvised performances in parks and other public spaces that resemble a street brawl or scuffle. Hemmed in by the crowded, enclosed indoor space of the café, Gonzo’s members grappled with each other on the floor, creating a bristling tension that electrified the entire space each time “contact” was made. As the clock approached 11:00 and the Chuo line train continued to rumble overhead, The Teachers Eri Tomioka capped the night off with a live performance of their own. What distinguished each of these events held throughout the evening was their limited duration and live, one-night-only character. At an entry charge of only ¥1000 with a free drink thrown in, the program was a rare treat for all those present, chock-full of performances that could only be experienced face-to-face. Although this inaugural kickoff event had not been widely publicized, the impressive showing of almost 300 people was proof of the evening’s extravagant lineup, as well as the local community’s high level of interest in the project and what it had in store for the future. The enthusiastic turnout in response to TERATOTERA’s inaugural event was, by any measure, a welcoming sign. TABlog later spoke with the project’s chief director, Nozomu Ogawa about his future plans. 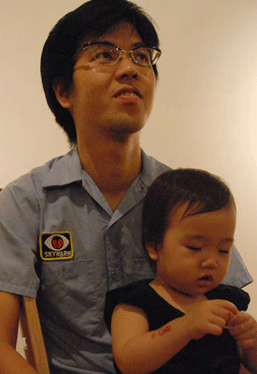 After graduating from Musashino Art University, Ogawa organized and curated “Ongoing”, a unique annual open call exhibition while pursuing a Master’s degree at Tokyo University. Having overseen five editions of Ongoing from 2002 to 2006, he opened the independent art space Art Center Ongoing in Kichijoji in 2008. With a café on the first floor and an exhibition space upstairs, Art Center Ongoing invites a wide variety of special guests to give talks and lectures on the weekends. The interior of the space was built by hand with the help of artists sympathetic to Ogawa’s interests and objectives. With his hands full running both Art Center Ongoing and TERATOTERA, Ogawa says he has no time for his own art, although he adds that “this space is, in and of itself, my own artwork”. The constant coming and going of people who come through the space has helped to make Ongoing a vital, constantly evolving space. 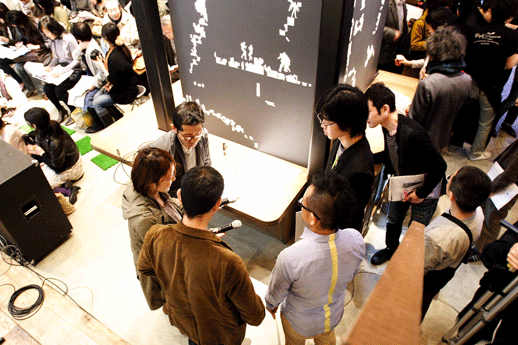 With an extensive network of more than 300 active artists that Ogawa has built up since he started organizing the Ongoing exhibitions, Art Center Ongoing continues to cultivate a close relationship with the town of Kichijoji – a successful example of a social space where artists and art lovers can get together to share ideas and build relationships. Local artists congregate in the café to refine and polish the ideas behind their work while chatting with visitors; art lovers can relax with a drink and browse art books and other materials after taking in an exhibition. 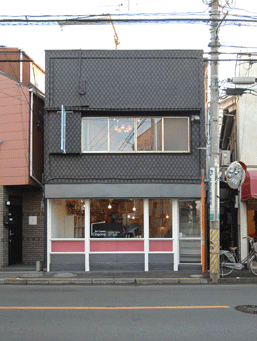 Just like the Parisian art salons of old, Art Center Ongoing seems to provide a model for the construction of hubs where Tokyo’s unique art and culture can be shared and cultivated. TERATOTERA, which hopes to capitalize on the cultural appeal of the Chuo Line through art venues such as Art Center Ongoing, is being organized as part of a series of events initiated by the Tokyo Artpoint Project. All this is part of a larger government-funded initiative called the Tokyo Culture Creation Project, launched last year in order to bring people together through art and foster the creation of Tokyo’s urban and artistic culture through the participation of local communities and citizens. If Ongoing is a venue that specializes in visual art, perhaps TERATOTERA will become a comprehensive platform that covers a wide array of creative production, including music, theater and fashion. “Kichijoji is a really popular part of town, but in fact there are surprisingly few galleries or museums that define it as a unique area. Through TERATOTERA, I hope this area becomes known as a place where interesting events and things happen,” says Ogawa. In addition to Ogawa, TERATOTERA is managed by two other director/coordinators, Makoto Kunitoki and Ayako Osanai. Based out of Nishi-Ogikubo and Koenji respectively, Kunitoki and Osanai are working to strengthen local networks in their neighborhoods and disseminate information related to the art and culture of the Chuo Line. Upcoming plans include the creation of a map of the area’s attractions (due out in October) and the TERATOTERA Festival to round out the year (scheduled for February 2011). A project called “Stopover Trip”, consisting of a series of exhibitions, talks and live performances, will also be held over the course of this year in 7 installments. 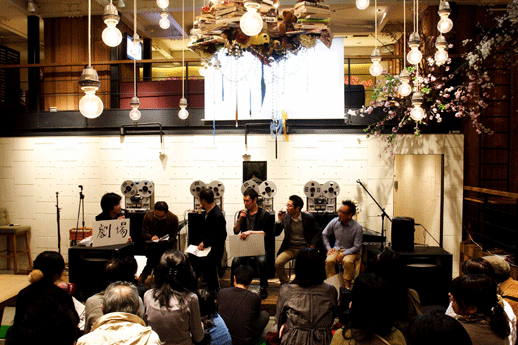 The first installment, held on June 6 at Amp Café, a gallery and live performance venue in Koenji, included a group discussion between Amp Café director Kenji Daikoku, artist Ryuichi Ogino and TERATOTERA’s staff members Nozomu Ogawa, Makoto Kunitoki and Ayako Osanai. The second installment, to be held from June 19-22 at the Baus Theater in Kichijoji, will feature a jam-packed schedule of events sure to appeal not just to art fans. The lineup includes screenings of the film “Shutters 4” and a series of talks by invited guests. The film’s cast will make an appearance on the 19th, musicians Ren Takada and Morio Agata will give talks on the 20th and 21st respectively, while Fram Kitagawa and Asia University associate professor Yoshinao Usami will hold a discussion on the 22nd. Each of the towns on the Chuo Line has their own fun-filled gourmet and shopping destinations. This stretch of Tokyo has its fair share of unique urban culture: Kichijoji, currently voted as Tokyo’s most desirable town to live in; Nishi-Ogikubo, with its lingering spirit of hippie rebellion; Ogikubo, with its legendary ramen shops and close association with classical music; Asagaya, with its annual popular jazz festival; and rock town Koenji, with its myriad of small live concert venues. 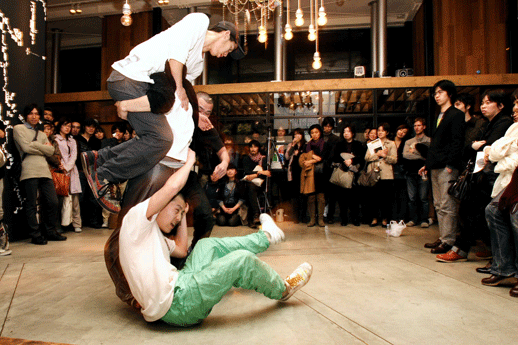 If the dynamism of this kickoff event is anything to go by, the launch of TERATOTERA will help to attract larger numbers of both locals and Tokyoites from further afield to enjoy the area’s art-related offerings, enhancing the Chuo Line’s status as one of Tokyo’s most distinctive and exciting cultural hotspots.